Ally McCoist has told Rangers boss Steven Gerrard to take a leaf out of Craig Levein’s tactics book if he wants to learn how to topple Celtic. The new Ibrox boss suffered defeat in his first Old Firm clash on Sunday as his old Liverpool mentor Brendan Rodgers masterminded a 1-0 victory for the Hoops. Gerrard’s attempt to contain the champions failed to pay off during a one-sided Parkhead triumph as Olivier Ntcham’s winner broke Gers’ resistance. It could have been a heavier scoreline had it not been for Ibrox stopper Allan McGregor and the Light Blues’ woodwork, which was struck four times. It was a defeat which has sparked another round of debate on whether Rangers are any closer to catching up with Rodgers’ dominant double treble winners but former Ibrox boss McCoist is certain progress has been made. However, he believes a change in approach is required if Celtic are to be stopped when the sides meet again on December 29. And having watching Hearts side stun Celtic 4-0 last year before coming out on top at Tynecastle again last month, he reckons the Levein masterplan is the way to go. “Hearts have probably showed over the last couple of years how to capitalise on any weaknesses or vulnerabilities that Celtic have, particularly at Tynecastle and I think that’s the way to play them,” said Gers’ all-time top scorer. “You need to get in about them. “That takes a lot of energy but Hearts have proved it can be done. But McCoist does not foresee any knee-jerk reaction coming from the Ibrox manager’s office after their poor Parkhead performance, despite the result consigning Rangers to their worst start to a league campaign in 29 years. He said: “Rangers goalkeeper gave a man-of-the-match performance, so that tells you all you need to know about the game. But for Allan McGregor, who I thought was excellent, it could have been more than one. “But taking a step back there has definitely - definitely - progress made from Rangers, with the European side of things very encouraging. “However, this result is maybe a wee reminder of how far Rangers have got to go to get back to challenging Celtic who on that performance are clearly the best team in the country. “Rangers have improved and are improving. I’ve played in Old Firm games where we played well and lost and ones where we played poorly and won. So you can take these games in isolation and say this time that Celtic were the better team and deserved to win. 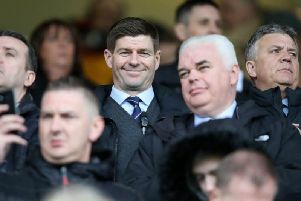 “But the bigger picture is that Steven Gerrard is doing a good job, should be encouraged and I certainly don’t think he will be pressing any panic buttons. • McCoist was speaking at a William Hill event at Hampden. William Hill are the proud sponsors of the Scottish Cup.